GoVision Polarized 1080p HD Video-Capture Sunglasses with Built-In Bluetooth 4.0 Speakers, Smart Assistant Voice Command, 15MP Still Camera, 8GB microSDHC Card and Case. 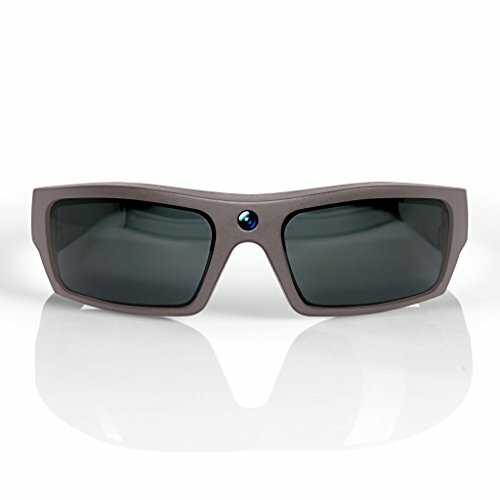 Show the world your point of view with these sleep 1440x 1080p sunglasses. Their built-in HD video camera makes recording the moment as easy as looking at the action and best of all, all hands-free. They provide UV protection to keep your eyes happy too. Incoming call? Answer with the press of a button and speak right though the glasses. Press again to hang up. You can even stream your playlist. Now that's what we call made in the shades. Also captures 15MP still photos, Rugged frames with UV protection, Lightweight and durable, Use them just like regular sunglasses. Make calls directly from your glasses at the press of a single button, Press again to end the call at any time, Built-in microphone, Records rich audio to complement your high-definition video. Enjoy up to 3 hours of music streaming on a single charge, Easily recharge with the included USB charging cable with Microfiber cleaning cloth to Keep your lenses and sensor clean. Bluetooth 4.0, Enjoy hands-free calling, two-way talk and streaming music when paired with your Android or Apple smartphone. If you have any questions about this product by GoVision, contact us by completing and submitting the form below. If you are looking for a specif part number, please include it with your message.